Today is the day to thank veterans. I reflected on this this morning, trying to decide who I specifically would like to thank. I settled on Merlyn Dethlefsen. I met Major Dethlefsen in 1969 at Vance Air Force Base as I entered pilot training. Major Dethlefsen was easily recognizable. If you saw him in his flight suit, the first thing you noticed was his patch that said ‘North Vietnam 100 Missions F-105.’ If you saw him in his dress uniform the first thing you noticed was the Congressional Medal of Honor around his neck. How cool is that? It made a huge impression on me as a new Air Force officer and pilot trainee. And I’m sure it impressed most of the students that came through Vance in those years. I had wanted to fly since a kid, but I didn’t give a lot of thought to what I’d like to fly until I got to Vance and got to be around some fighter pilots like Major Dethlefsen. Most people don’t really understand what it took to earn a 100 mission patch. Many, many fell short. Not because they couldn’t hack it, but because they were shot down and killed or became a POW. As an example, a friend of mine that flew 105’s in Vietnam, said that when he arrived the squadron had 24 planes. By the time he left, 20 of those original planes had been shot down. To earn the Medal of Honor was even more rare. The Air Force awarded 13 MOH’s during Vietnam. Four of those were fighter pilots and two of the four were awarded the medal for actions while a POW. So to have met Merlyn Dethlefsen while in pilot training was a rare treat, and a major influence on my military aviation career. 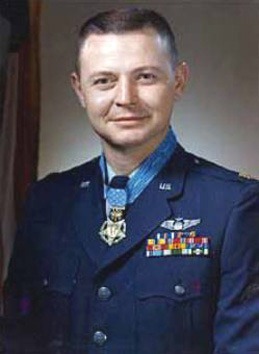 Merlyn Hans Dethlefsen (June 29, 1934 – December 14, 1987) was a United States Air Force officer and a recipient of the United States military’s highest decoration—the Medal of Honor—for his actions in the Vietnam War. He was flying F-105’s out of Takhli RTAFB on March10, 1967 as a part of a 72 plane strike package to the Thai Nguyen iron and steel works near Hanoi North Vietnam. Maj. Dethlefsen was 1 of a flight of F-105 aircraft engaged in a fire suppression mission designed to destroy a key antiaircraft defensive complex containing surface-to-air missiles (SAM), an exceptionally heavy concentration of antiaircraft artillery, and other automatic weapons. The defensive network was situated to dominate the approach and provide protection to an important North Vietnam industrial center that was scheduled to be attacked by fighter bombers immediately after the strike by Maj. Dethlefsen’s flight. In the initial attack on the defensive complex the lead aircraft was crippled, and Maj. Dethlefsen’s aircraft was extensively damaged by the intense enemy fire. Realizing that the success of the impending fighter bomber attack on the center now depended on his ability to effectively suppress the defensive fire, Maj. Dethlefsen ignored the enemy’s overwhelming firepower and the damage to his aircraft and pressed his attack. Despite a continuing hail of antiaircraft fire, deadly surface-to-air missiles, and counterattacks by MIG interceptors, Maj. Dethlefsen flew repeated close range strikes to silence the enemy defensive positions with bombs and cannon fire. His action in rendering ineffective the defensive SAM and antiaircraft artillery sites enabled the ensuing fighter bombers to strike successfully the important industrial target without loss or damage to their aircraft, thereby appreciably reducing the enemy’s ability to provide essential war material. Maj. Dethlefsen’s consummate skill and selfless dedication to this significant mission were in keeping with the highest traditions of the U.S. Air Force and reflect great credit upon himself and the Armed Forces of his country. Do you want to read more about these kind of folks? Here’s a list of several good ones I’ve recently read. Thank you for the recognition and memories.